Who doesn’t like to take pictures? Well, everyone does and to add an advantage you can have the picture print instantly with a Best instant camera. Although most people use smartphones for taking pictures these days, you cannot deny the importance and the advantage of an instant camera. So, if you still looking for an instant camera, then you should read these reviews. Here we give you the top 10 instant cameras of 2019 which are under $100. These are affordable yet very feature-rich cameras that you should get. You can choose one best instant camera 2019 from these ten. How to choose the best instant cameras? Whenever you want to buy instant cameras, you should know all about these cameras. You should search the features and the price of these cameras. You should read instant camera reviews online. These reviews will help you give an insight about these cameras. To make it easy for you, we have reviewed the top ten instant cameras for 2019 which you can buy under $100. The FujiFilm cameras are some of the best instant cameras around the world. The Instax series by FujiFilm is a great instant camera series which users across the world rate very highly. The Instax Mini 8 is a great camera. It is compact in size, user-friendly for operating and has an attractive exterior. The price is also very much affordable. It is no doubt the one of the best instant camera Fujifilm in the market. The pink colored camera is very attractive. The design is good, and the price is low as compared to other cameras. The pink color is very attractive and looks great in hands. The design is small which makes it easy to use with a single hand. It is a great camera for both daylight and night time. It has five different shooting modes. It is easy to select the exposure level to take better quality pictures using the adjustment dial around the lens. It has a constant firing flash which allows you to capture bright images even at night. Another great quality is the shooting range. This camera offers a shooting range from 0.6 meters to infinity. The picture size is 62 x 46 mm. for many users it may be good, and for a few, it may be very small. It is a lightweight camera as it weighs only 307 grams. It is also slimmer than many other models of instant cameras. It only supports Fujifilm Instant Color Film “Instax Mini” which is expensive. It takes some time to develop the photos. If you love to take some Polaroid photos, then you should look for a camera which is good at it. 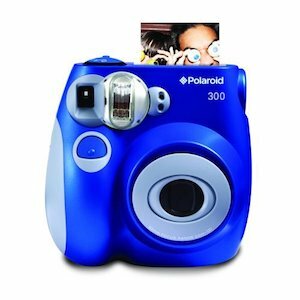 The PIC-300 instant camera is a great choice for those who love Polaroid. It is a compact camera with some great features. For those who enjoy the instant imagery, they should pick something retro such as this. The design of the camera is great. You will like the design of the lens; its casing is like an eye. It has four scene settings which you can adjust for various light situations. It also has an automatic flash. It also comes with a handy energy saving feature. It is a great choice for saving battery power. 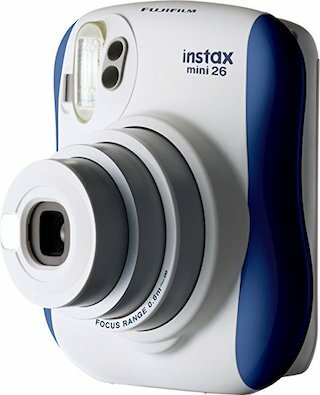 If you want an instant picture with good quality, you should get this instant camera. The price of this camera on Amazon is varied on your choice. It is also a cheap instant camera. The lens is great. With the automatic extending lens you can set two focus zones. It allows you to take better pictures. The picture size is also large; it is almost standard. It also has a small LCD screen which makes control easy. The shutter speed is also good which allows you to capture motion pictures with great quality. The shutter speed of this camera is better than many other instant camera models. The picture size is 99 x 62 mm. The design looks like a digital camera. It is easy to use. Placing the film inside is easy. The tripod helps you take clear and fine quality photos. It only accepts FujiFilm Instax Wide instant color film. The film is expensive. It takes some time to print the photos. If you want sophistication, then you should buy this instant camera. It is a great camera which has dozens of features. With these features, it outclasses many other models on the market. It prints the picture in a larger format. The size is almost standard. 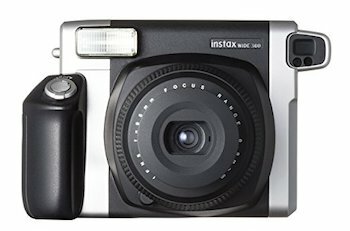 So, if you want an instant camera that prints large photos you should get the Fujifilm Instax Wide 300 Instant Film Camera. It has a tripod socket, lens dial, the lens is also retractable, etc. It is an easy to use the camera with an intuitive design. The design is kid-friendly. If you want a camera that takes large photos with god quality and low price you should buy this on. This is a durable and perfect camera for capturing the photos. It has dual sensors which are powerful to capture the fine photos and videos. There is no match of its fine and high quality. This is very good camera for the photographer to use as a hobby. It needs the external memory because its internal memory is not enough. It can record the video only for 20 minutes continously. There are many models of FujiFilm instant cameras which are small as the Instax Mini 8 and have features of the Wide 300. One of such cameras is the Fujifilm Instax Mini 70 – Instant Film Camera. It has a lot of features with a very compact size. It is a pocket-friendly camera that you can take anywhere. 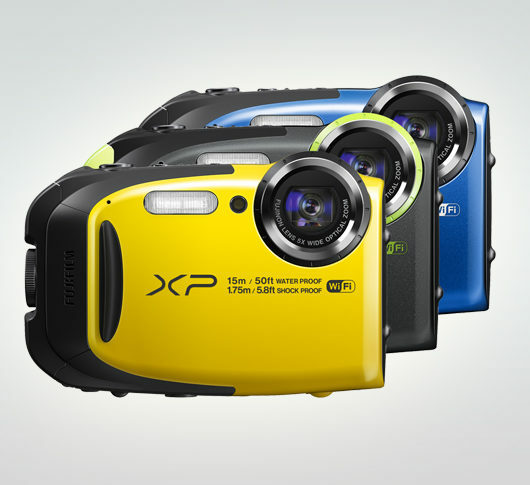 It has features such as a retractable lens, optical viewfinder, and much more. It is a feature-rich instant camera. What we like is the one extra mode on this camera i.e. the Selfie-mode. Now you can take Selfies using this instant camera. It also comes with automatic exposure control which is very handy. he flash is good and produces better images in low light. With the shutter speed of 1/4-00 sec, you can now take top quality pictures. It is very lightweight, and you can fit it in the pocket. It only accepts Accepts Fujifilm Instax Mini Instant Film. The film is expensive and only has ten photos. The picture size is small. 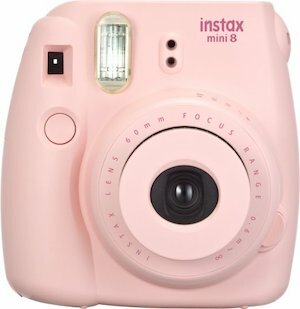 The Fujifilm Instax Mini 70 – Instant Film Camera is a great choice for both Tudors and indoors. If you want a compact camera with some extra features and a low price, you should buy this one. It is easy to use and also produces excellent quality images. It is a perfect camera for a school girl. As the name suggests “Kitty,” it means that it has a kitten shape. It looks great, only in the hands of a small girl. But you should not worry about the design. It has some excellent features, and it produces excellent pictures in bright light. The lens on this Camera is great and ensures good photo quality. The pink color and the kitten design are very attractive. The size is small, and you can use it with one hand. It has five different shooting modes for various situations. It has a brightness adjustment dial which allows you to control the exposure while taking the photos. It also includes a Hellow Kitty special edition items. It has a high key mode which enables you to take photos with a soft look. It does not come with instant film. The flash is fixed and always fires. The shutter speed is not adjustable it is 1/60 second. 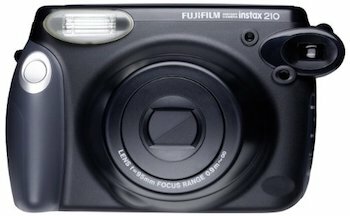 Among many FujiFilm instant cameras, the Fujifilm INSTAX 210 Instant wide Photo Camera is a good choice. It has some excellent features and a great design. The design is professional. It takes brilliant pictures. The biggest advantage is that the pictures are large. It also has a good printing technology which prints the images better and quickly. It is a fast processing camera as compared to other models. It has a LCD control panel which is very easy to use. The LCD displays the focal distance which is very helpful in taking the photos. It also displays the film count. It has a great low light auto flash. It is not an automatic flash, which means you can turn it on and off. It produces wider prints – 4.25 x 3.4-inches. It does not include a film you will have to buy it separately. If you are looking for a camera that prints large images with good quality you should get this instant camera cheap model from Amazon. It will produce excellent pictures. Are you looking for a digital instant print camera? If yes, then you should have a look at the Polaroid Z2300 10MP Digital Instant Print Camera. It is a great camera with 10 MP sensors. The ten megapixel will allow you to take some great quality images. The printer on this model is also good. It will produce excellent quality 10 MP pictures. It produces full-color images under a minute. As it is a digital model, it also has all the features of a digital camera such as memory card, etc. It is a great camera with digital features. The picture size is also standard. It also has an expandable memory so you can store images before printing. You can also record HD videos with this camera. The print paper is also of fine quality. The camera prints the pictures in less than one minute. This camera is great for everyday photos. You can rely on it as it will produce and print some excellent quality pictures. The ZINK print technology is great and is better than many other inkjet printing technologies. It is also a cheap camera, so you do not have to worry about the price. 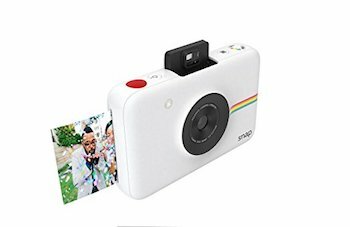 Another great instant camera which produces excellent quality 2 x 3-inch photos is the Polaroid Snap Instant Digital Camera (White) with ZINK Zero Ink Printing Technology. It also has a 10 MP digital sensor for taking good quality photos. 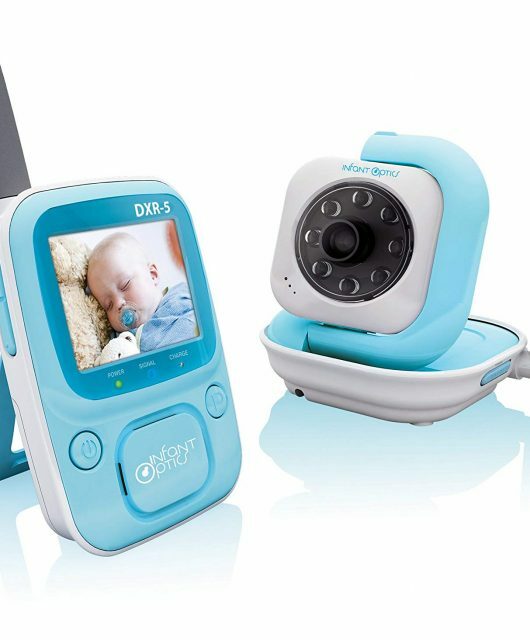 The camera has a great design and an easy to use button placement. It is compact and has less weight. The size may be a bit large, but you can always hold it in tow hands. Has quality to reproduce high resolution colors. The pictures it prints are smudge proof and water resistant. The paper quality is fine and is also tear resistant. Takes less than a minute to print. The print is instant dry. Print size is large as compares to other instant cameras. Has memory card capacity up to 32 GB. It has six different photo modes. Also, has a low battery indicator. It has no paper indicator. The camera does not have a flash. The rechargeable battery is not user replaceable. If you are looking for a high-quality instant print camera, then you should get the Polaroid Snap Instant Digital Camera. It is a great choice for most users. It has good features and also captures vivid bright pictures. The print time is also less. It does not use any ink, so there is no mess at all. The camera is also cheap. 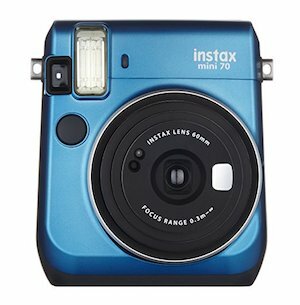 The Fujifilm Instax Mini 26 Instant Camera is a great choice for those who like to have fun. It is a compact, lightweight camera which prints some good quality pictures. 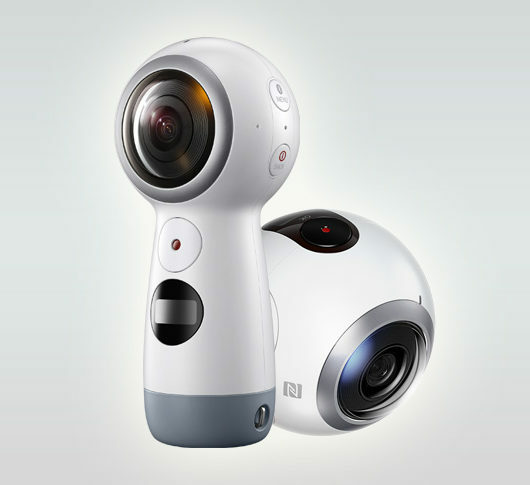 The design is great, and you will like the feel of the camera. The body shape is also curved which makes it look professional. The weight is 275 grams. It has various features such as a Selfie mirror, a close-up lens, two shutter buttons, etc. The camera produces good prints. It has a button on the top which you can use to control the intensity of the color of the print. It also has a Selfie mirror which makes it an excellent choice for taking Selfies. Adjustment button allows you to adjust the lens for better images. The film is of good quality which allows you to print vivid pictures. It has an intelligent flash which fills the room with light. It is a perfect choice for dark spaces. Thanks to the Lighten Darker controls on the camera. You can take close-up shots with the high-quality lens. You can get 35cm close shots without any distortion. What we like the most are the two shutter buttons. Now you can take the pictures in both portrait and landscape modes. Only uses Instax Mini Style film. Selfie quality may not be top notch. It is a great camera with some great features. It comes with a low price. The print quality is good. It also allows you to take Selfies and print them instantly. Shooting is easy with its design. It also has two shutter buttons which make it easy to take photos in two modes. It is a good quality instant camera. 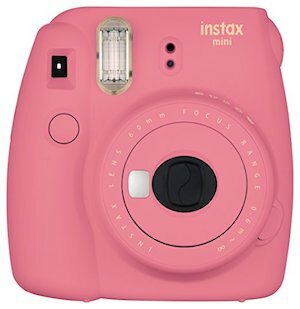 The Fujifilm Instax Mini 9 Instant Camera – Flamingo Pink is another great addition from FujiFilm. This camera takes 62 x 46 mm pictures. You get a shooting range from 0.3 m to infinity. 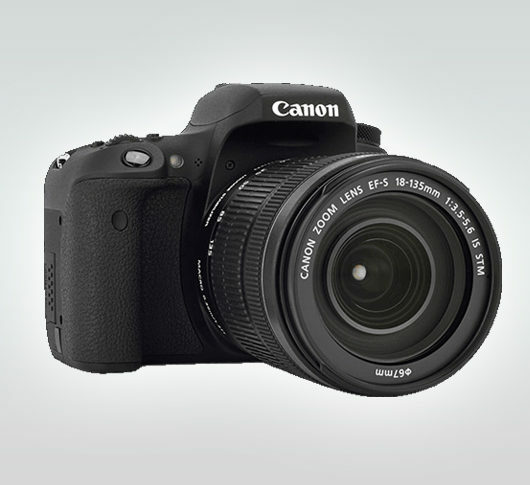 The camera also features retracting lens which you can use to take close-up pictures. It also has an automatic exposure mode. This mode takes a better picture even in low light. Overall it is a great choice. The design good and makes it attractive and easy to use with single hand. The flash and exposure settings make it an excellent choice for both daylight and night time shooting. The lens is retractable which allows you to print close up images, 35 to 50 cm. It is what makes this camera an excellent choice for Selfies. The picture size is 62 x 46 mm. The cost of the prints is a little higher. Overall it is a great camera with some great features in it. If you want a top notch Fujifilm camera which also allows you to capture Selfies you should buy this one. It is a good model which has various features. It also prints the pictures quickly quickie as compared to other models. The price is also low. You just have to pay $63 on Amazon for this. Whenever you want to get hands on an instant camera, you should look for these features. You should look for the overall camera quality. Make sure that it has a strong build and a good look. It should come in one hand easily. It should have easy placement of buttons so that you can use it with a single hand. The size and camera quality matters a lot. The sole purpose of the instant camera is to print a picture instantly. So, you should always look for the picture quality it will print. There are many cameras which do not offer a colorful picture. There are many models and brands which do not print good shades as the print mechanism is not good. So, always look for a camera which has a good print quality. What type of film does the camera accept? It should accept all kinds of films such as Polaroid films, Mini Instant Film, etc. 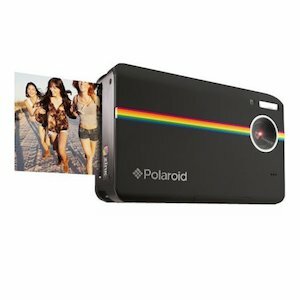 Buy the one which has instant camera Polaroid film acceptance. The focus mode is very important. If the camera does not have a good lens, it will not focus quickly. Only a top quality lens has a good focus mode. Make sure that you get a camera which has a shooting or focus range of 4 feet and more. The size of the picture depends on the size of the camera. Every camera has a different size of the print. You should look into the size of picture it will print and then choose accordingly. When you read about our top ten instant cameras, you will know what size of picture each camera prints. It will make the buying decision easy for you. No need to spend money and wait for a long time to get the picture print. With the instant camera, you will get the print with a single click of a button. You get retro-style imagery from these cameras. The picture of these instant cameras is unique. If you are going to a party or have a party at your home, then you will know the benefit of these cameras. You get to print an instant image and can give the pictures to your friends or family members on the spot. These cameras are very beneficial for those who enjoy the instant imagery. The instant cameras are cheap. You can always practice different shots using these cameras to get a perfect shot finally. These cameras are very low-priced as compared to many other digital cameras of today. Most people like to use these cameras as a hobby, but you can also use these cameras for evidence. The instant cameras are great for fun, adventure and also quite handy at the time of need. You may not be a fan of instant cameras, but once you use these cameras, you will know these are very beneficial. The above instant cameras are the best top 10 instant cameras for this year. These are not only excellent in quality but also very cheap. We only choose the best and the cheapest instant cameras for you. 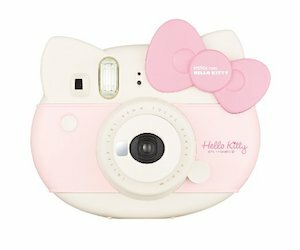 Once you read the above instant camera reviews, you will know that these instant cameras are very useful and worthy of buying. You can take these cameras to a party, a meeting, to get evidence, or just for fun on holiday with friends or family. So, make sure that you buy one of these ten cameras according to your needs and budget.